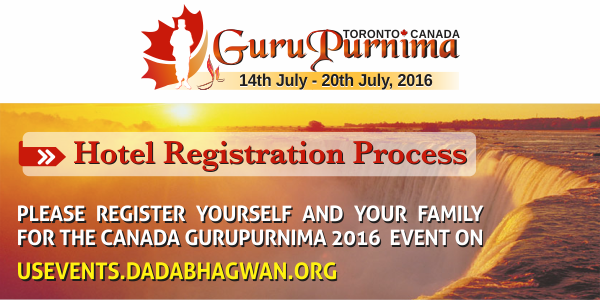 The Canada Dadabhagwan Parivar would like to send out an update regarding the Hotel Room Reservation process. We are happy to let you know, we have received an overwhelming response from all of you and are very excited to host the upcoming Gurupurnima in 2016! As you are all aware, starting this year, we have modified our hotel reservation process in an effort to make the hotel reservation process smoother for all mahatmas. Starting from the 3rd week of January 2016 onwards, personalized emails will be sent to all mahatmas who have registered on the usevents website and requested Hotel rooms. The email will come from gp@ca.dadabhagwan.org. Please save this email address in your contact/address book. Once you receive that email, you will have 5 days within which to call and book your assigned room. Hotel Rooms are based on actual persons registered on the website, that is who have received a 2016 GP Registration number and been assigned a Room Type on the Hotel Room page. Have been assigned a Single Bed room, if you are sharing your room with someone else who has not yet registered. Have been assigned a Single Bed room, if you are sharing your room with someone else who has registered but, their information has not been entered on your Hotel room booking page. The name of Mahatmas in the room and their 2016 GP Registration Confirmation Number. The Hotel Name, the Hotel Address and Hotel Telephone Number. Your Hotel Confirmation Number for the rooms assigned on usevents website. You have to call the Hotel number given to you in the email, and book the room by providing the Hotel with a valid credit card. In order to make this a successful event, we need your support in ensuring you follow the instructions as outlined above. Copyright Â© 2016 Dada Bhagwan Vignan Institute, All rights reserved.